The Center for Documentation and Studies on Josemaría Escrivá (CEDEJ) which is a section of the St. Josemaría Escrivá Historical Institute (ISJE) based in Pamplona (Spain), has launched the “Text Bank” on the founder of Opus Dei. 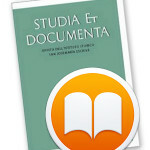 This is an open access digital tool containing a selection of books which bring together quotations from the oral preaching of St. Josemaría as well as his writings, such as letters to Opus Dei members, “Personal Notes”, correspondence etc. These quotations have in common that they are taken from previously unpublished sources although some fragments have already appeared in print. Click here to view the Text Bank.